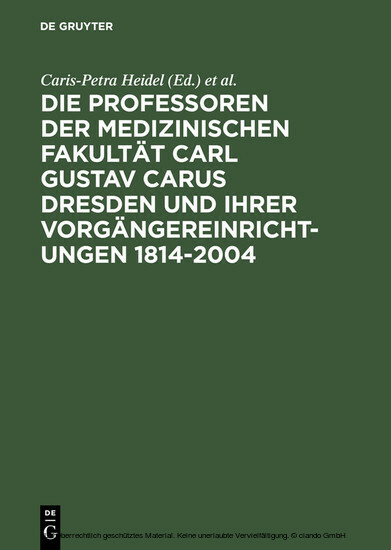 This publication presents, in alphabetical order, all the professors of the academy of medicine and the medical faculty Carl Gustav Carus at the Technical University of Dresden and the facilities which proceeded them over a period of almost 200 years. The biographical articles contain the dates of life and death, a short biography, information on the main focus of work and research, a list of important publications, information on active involvement in committees and societies, a summary of honours and awards, as well as references to further literature. The short biographies contain details of studies, gaining licence to practice, doctorate and post doctoral qualifications, on becoming recognized as a specialist, nomination, appointment to a chair and changes of chair, as well as retiring from the university.